We are delighted to offer the excellent Flower Small Clay Chimenea. With so many on offer recently, it is wise to have a brand you can recognise. The Flower Small Clay Chimenea is certainly that and will be a great purchase. 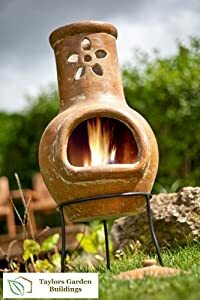 For this price, the Flower Small Clay Chimenea comes widely recommended and is always a popular choice for lots of people. CMD Ltd have added some excellent touches and this equals great value for money. Product Description Our smallest but cutest chimenea is the Flower Cut Out Small Clay Chimenea - Copper Effect. Supplied with a tall three legged stand to lift the chimenea off the ground to an easier to use height. As its name suggests the Flower Cut-Out Chimenea features a flower print that has been cut out from the chimney section adding another level of detail. It is also supplied with a chimney lid for when it is not in use. Height:70cm x Diameter: 31cm Remember: never light a big fire the first time you use a clay chimenea. Start with a small fire which helps to heat treat the clay. Its common for people to light big roaring fires the first time they use a clay chimenea only then to see that the chimenea has cracked. Tip: Use chimenea sealer each year to restore and care for your chimenea.